“It’s pretty neat,” said Peter Shankman, a New York City-based entrepreneur and podcast host who racks up hundreds of thousands of frequent flyer miles each year through his work as a corporate speaker. (NEW YORK) — An entrepreneur who travels the world for work has made the holidays brighter for a group of complete strangers by giving them his frequent flyer miles. 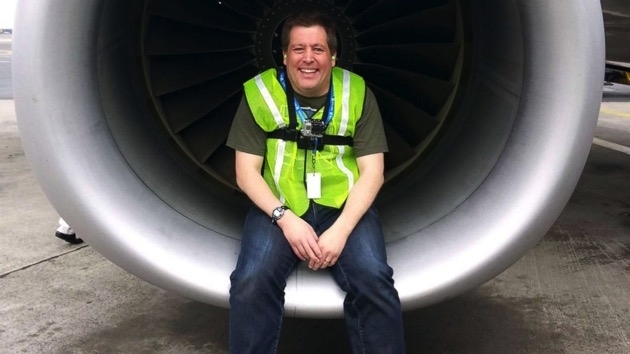 Peter Shankman’s donation is allowing five people from across the country to fly home over the holidays. “It’s pretty neat,” said Shankman, a New York City-based entrepreneur and podcast host who racks up hundreds of thousands of frequent flyer miles each year through his work as a corporate speaker. Shankman, 46, started donating his miles to strangers five years ago in an initiative he calls Home for the Holidays. He now finds applicants via Imgur, an image sharing social media site. Applicants explain why they want or need the miles and then other Imgur users vote on who should be selected, according to Shankman. One of this year’s winners is Morgan Bothwell, a musician in Kansas who will be able to spend Christmas with his parents in New Hampshire. Bothwell said his mom, Leslie Bothwell, did not believe him when he told her that he had won a first-class ticket home. Another family that will be reunited this Christmas thanks to Shankman is Max Jacobson and his older brother, Alex Jacobson. Max Jacobson, 31, asked for a ticket for his 34-year-old brother to fly from Los Angeles to see their family in Provo, Utah. The brothers plan to surprise a group of around 30 family members on Dec. 23. “I really was thinking of my mom and I wanted her to be able to see her son again,” said Max Jacobson, adding that he expects his mom to scream when she sees Alex. Other recipients this year include a mom who will be able to visit her son’s gravesite for the first time in a decade, and a man who is going to surprise his brother in the military. Shankman said he has received photos and videos from past winners showing joyful reactions when they make it home to their families thanks to his frequent flyer miles. “It’s a great feeling to know that I could do this,” he said. Shankman works with Imgur officials to connect directly with the winners. His generosity has inspired other Imgur users to donate their frequent flyer miles as well, the company said. Shankman estimates he has helped more than 100 people make it home for the holidays in the five years he’s been donating his miles. “I plan on doing it every year that I can, as much as I can,” said Shankman. United Airlines, the airline on which Shankman flies, told Good Morning America exclusively they plan to donate 200,000 miles, the amount of miles Shankman used, to a charity of his choice.